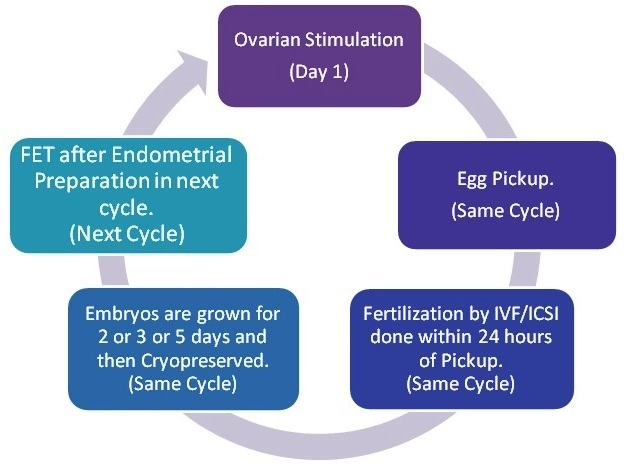 In IVF Extended Cycle the embryos are not transferred to the Intended mother in the same cycle. All the fresh Embryos are cryopreserved. The Frozen Embryo Transfer (FET) is done in a different cycle. It may be done in the next immediate cycle or after a gap of few months, as determined by the consultant IVF speciaslist. Before the FET is done the Intended Mother is given medicines for Endometrium Preparation. Why Is IVF Extended Cycle better than IVF- Same cycle. >> Advancement in cryopreservation techniques has resulted in better survival of embryos. This has made it possible to freeze entire batch of embryos rather than freezing the “second best” embryos after morphologically best embryos are transferred in fresh cycles. >> Increased use of genetic screening also increased the use of cryopreservation, because embryos are often frozen, while awaiting tests results. After genetic screening, transfer of normal (euploid) embryos may contribute in increasing FET success rates. >> Freezing the entire batch of embryos is increasingly recommended in women susceptible to Ovarian Hyper Stimulation Syndrome (OHSS) who are administered with GnRH agonist to prevent OHSS. >> The steady increase in single Embryo Transfer policy, also have left more embryos for Cryopreservation and FET. Ovulation Induction or in other words Super-ovulation with gonadotropins (hormones) is an integral part of the IVF process. Because controlled ovarian-hyperstimulation (COH) allows the retrieval of multiple oocytes for fertilization and embryo development. However superovulation results in high level of hormones such as Estrogen (E2), Progesterone (P4) and Vascular Endothelial Growth Factors (VEGF), both during oocytes development and after embryo transfer. High level of E2, P4 and VGEF leads to potential changes in the oocyte, endometrium and implanting embryo. Ectopic pregnancy risk is greater in IVF pregnancies than with natural pregnancies. This is due to effect of increased level of E2 hormone on uterine contractions or increased P4 effect on tubal cilia. FET has reduced risk of ectopic pregnancy. A fresh transfer with ICSI has increased risk for birth defects when compared with FET. There is growing body of evidence to support transferring embryos (ET) in a more physiologic (FET) rather than hyper stimulated environment. FET has a down side also such as increased cost, longer procedural time and inconvenience. FET is also associated with increased incidence of large for gestational age babies, placenta accreta and pregnancy induced hypertension. Still Fresh transfer cycles are gradually eliminating and IVF practice is shifting to all FET cycles.